The SegReg computer program (model) is designed to perform a segmented (piecewise) linear regression (in splines) of one dependent variable (Y, e.g. plant growth, crop yield) on one (X) or two (X and Z) independent (explanatory) variables (predictors), e.g. crop growth factors like depth of water table and soil salinity. It can also be condidered as a regression calculator. The segmentation is done by introducing a breakpoint (break-point, threshold, switching point). Thus one can obtain a broken, discontinuous, line. Seven types of functions (0 to 6) are used. Examples are given. In December 2008, an amplified version of the SegReg calculator (SegRegA) was made permitting the use of weight factors, preferred regression type or type exclusion. Although it can lead to manipulation, it is available on request. More details are found in the program itself. The mathematical model starts clicking on SegReg.Exe. A paper on the statistical principles of segmented regression with break-point, including the determination of its confidence interval, can be inspected in here. The construction of confidence intervals of the regression segments separated by the breakpoint, and of the breakpoint itself, is described in this confidence paper, which also gives an example. The calcuation of standard error of the breakpoint can be found in the BP paper. The intervals are made with Student's t-distribution, see the t-test program. The principles of regression analysis in general can be found in this lecture note. Furter, the analysis of variance (Anova) and the F-test for segmented linear regression with break-point, as used in the SegReg model calculator, is briefly discussed in this paper. 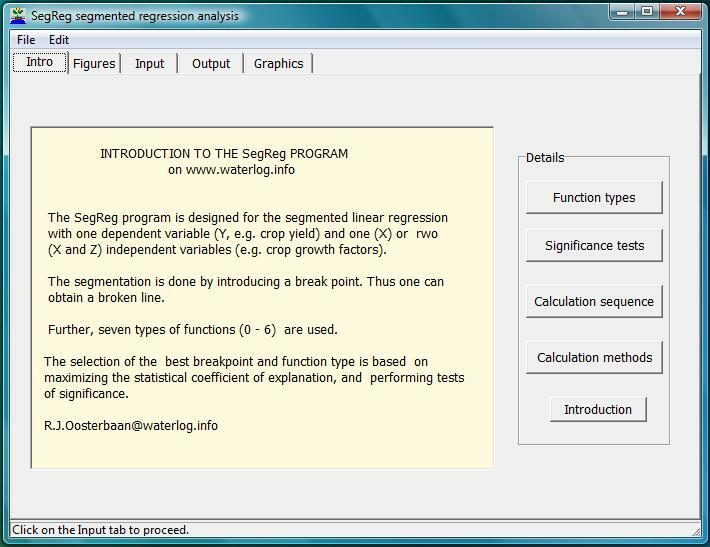 A lecture note on statistical analysis with examples of SegReg program applications is found in a document called Data Analysis. Se here a list of articles and publications using the SegReg calculator app. In September 2010, the SegReg program calculator was provided with new functionalities thanks to a request by Kirsten Otis so that the model permits extra applications. In March 2011 the confidence belts were improved thanks to questions raised by Linda Jung. In October 2012 the confidence block of the breakpoint for type 2 functions was improved thanks to questions raised by John Schukman. In March 2013 the use of a second independent variable was updated thanks to comments made by Barbara Mahler. In November 2013 the calculation of the standard error and confidence interval of the breakpoint (BP), as well as of the Y value at BP, was standardized for the different types of segmented regression. A description of the mathematics involved, with examples, can be seen in this confidence paper. These changes were motivated by suggestions put forward by Dawn Noren and Wenhuai Li. In January 2014 the conditions for Type 2, 3, 4 and 5 were made more strict thanks to an example provided by John Shukman. Experiences: For improvement, I am interested to learn about your experiences with SegReg. For this, there is a contact form. (1) - An amplification application of the SegReg program software permitting expression of preference for a certain type of segmentation, or of the wish to exclude a certain type, can be downloaded from SegRegA. It also gives the option to select an S-curve or a generalized third degree polynoom, see: S-curves or cubic. (2) - A different version of SegReg, called PartReg has been developed with the aim to detect the largest possible horizontal stretch in Type 3 and Type 4 relations. This has been done to find the maximum tolerance (or "no effect" reach of the dependent variable - e.g. crop yield - for changes in the dependent variable (e.g. 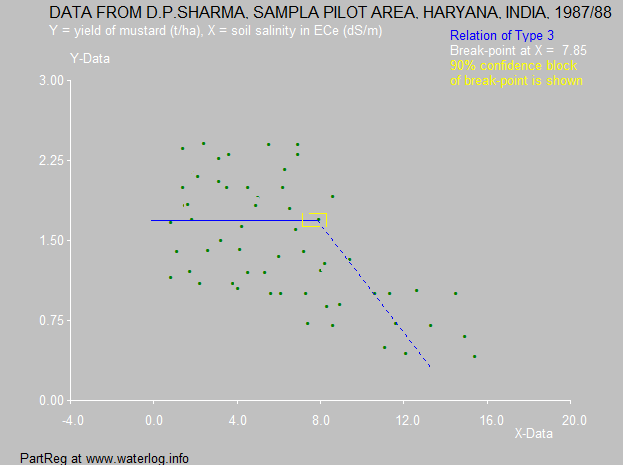 soil salinity or depth of the water table). See the figures below to appreciate the difference between SegReg and PartReg. The first minimizes the deviations of the model values from the observed ones over the entire domain, whereas the second calculates the maximum part (range) of the domain over which the regression coefficient (i.e. the slope of the regression line) can be taken equal to zero. 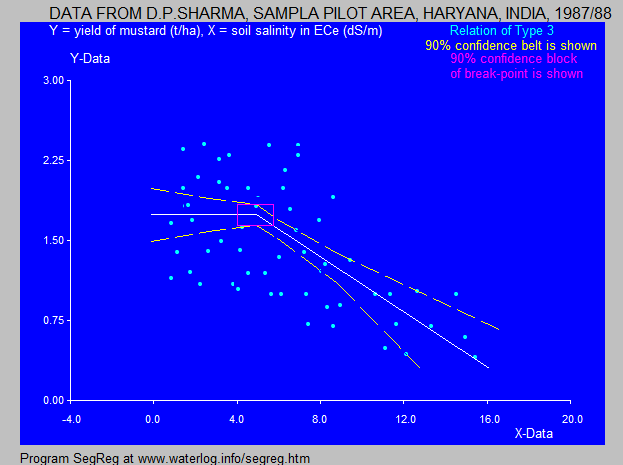 For more examples see this segmented regression article on page 13 and following, the tolerance paper on soil salinity tolerance of crops, or the sensitivity paper on sensitivity of crops to shallow watertables. The model comes with various explanations like programmed function types, calculation methods, and application of significance tests. high soil salinity or water level. This Type 3 is similar to the Maas-Hoffman model. the same data as above in the PartReg software application. almost ECe=8 dS/m. After this threshold the yield reduces. 8 dS/m there is no negative effect. The crop tolerates a depth of the water table of 7 dm. The Segreg software program is an application (app) made to detect different segmented models, like Type 4 in the above figure. The Segreg application (app) is software made to program different segmented models, for example Type 5 in the figure.